One would have thought that Icom would have kept that radio in production given its popularity. Well, looks like people will have to start designing and building their own HF listening systems at the rate these business execs in their “wisdom” keep discontinuing SW and Amateur products. What a shame and waste. I assumed thy ran out of parts. I suspect i’s not a big seller, so they don’t have clout to keep supplies coming. At the very least, they my have to do a redesign to deal with parts that are no longer available. Did it use Collins mechanical filters? Collins has r is about to stop making those. There were Japanese made mechanical filters in the sixties, but I’ve seen no mention in recent times. Even ceramic filters may be harder to get, at least the narrower and better spec’d ones. AM/FM radios are made in massive quantities, the parts will “always” be available. But shortwave radios, even portables but especially higher end, even a decent run is small compared to consumer radios. The parts may be fairly dedicated to the field. Meaning they won’t show up in consumer radios. The profit for the parts companies is elsewhere, so they stop the run. When ICs were new, lots of exotic “RF” ICs were introduced, but many are long out of production. Even MOSFETs have faded, other device coming along. On top of it all, the move is to more digital receivers, one reason Collins can get out of the mechanical filter business. Digital does it in software, and does it well, so that obsoletes old parts and old designs. Those Silicon Lab ICs are making inroads in low cost receivers because they do the job, offer more possibility, but don’t need a lot of external parts, or a lot of factory alignment. It’s similar to the move to ceramic filters decades ago, nice and cheap but eliminates IF transformers and their alignment. That brings down manufacturing cost. High end receivers are using fancier designs, but going digital makes it easier and cheaper. Michael, thank you for the reply. It may indeed be a supplier thing. Still, if people liked and wanted the product the production should have been there from the basic parts to the final radio. The R75 is an excellent radio, especially on SSB, but good on AM too. The filters are not from Collins, and are okay. That this radio is being replaced by SDR based technologies is kind of questionable. I do see SDR line ups coming and going, and they do not seem to be particularly reliable for software compatibility and updates. Also, the computer receivers are not particularly sensitive in many cases, and are bigger power hogs than the stand alone units. Still, the whole problem seems to be the international broadcasters, given fiscal strangulation policies are less willing to be on the HF bands. That has put the chill in many a company to get out of the SW business altogether. SSB/CW right now may live on, but given the smart phone/desktop era, and satellite the life expectancy of the pursuit is in question too. Although the amateurs have more ability to promote new individuals into the transceiving world and keep the industry alive, if it cooperates. I will be more positive if I see groups such as the ARRL and others even more vocal in promoting the value of the technology. The internet may have continued to function with the great Japanese earthquake of 2011, but it’s not indestructible and long range radio still has a role to play. Great Receiver….There is an eBay currently selling the last unit from Universal Radio…Item Number: 141956581757!! I proudly owned an IC-R75 for few years and it was a great receiver, low noise, excellent audio quality and after installing the optional narrow bandwith filter was even better. Its a shame its life is going to end soon but modern technologies as SDR have to replace the onsolete superheterodyne circuit for a better performance. If Icom decide to pull the plug on this one, its because a new redesigned receiver is coming soon, maybe something similar than the new IC7300 transceiver. I purchased a R-75 about one month ago on e-bay in very good condition for $500.00. I feel very fortunate getting it. I have noticed the price now to be $600.00+. The Icom-R75 is a solid workhorse that is especially good at copying weak DX signals. Even in this era of SDR I still prefer a standalone HF receiver with knobs and buttons as it adds greatly to to the overall listening enjoyment. Interacting with something physical is far more satisfying than a virtual and cold experience with a PC and software. I say this as someone who has worked in IT for a long time. I’ve seen what passes for “quality” in software and hardware today. It’s deplorable what actually gets pushed into the marketplace because it’s “good enough”. Pride and attention to detail have all but disappeared. I agree. It seems the newer they get the worse they perform. I have been using a R-75 for the last few years and it’s a good radio, but when listening to SSB I go to my Heathkit HR-1680 that I built in the 70’s. The R-75 doesn’t come close to the noise filtering of the Heathkit. I’m old school and I still don’t like listening to shortwave on a PC. Has anyone have experience with getting schematics and service manuals for these new SDR based radios. Many of the old “valve” based radios and even up to the newer standard superheterodyne radios seem to have them. I think the makers of the SDR’s are shooting themselves in the foot not providing them at least after the production runs end if their rationale is protecting proprietary information. You can find the user manual and schematics of Icom IC-7300 on the web. Any other SDRs you have in mind? 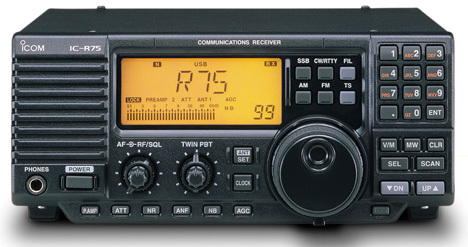 Good, that puts the IC-7300 on the list of candidates to buy. I am looking at them. I keep my stuff for a good long time and I service them myself and these manuals make it possible. Didn’t the R71 have a similar run? Sad indeed and it will become hard to find a decent receiver,especially in countries where SWLs can not own a transceiver without a ham license. anyway these receoivers that are in the market will last a few more years. We are still seeing some old va;lve communications receivers appearing on Ebay and also a new enthusiasm for these.